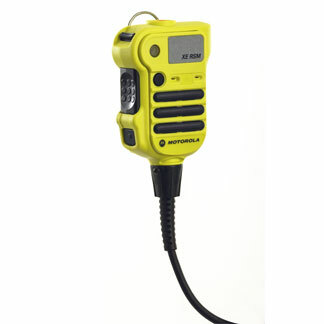 This APX XE Remote Speaker Microphone (RSM) with attached Xtreme Temperature Cable is ideal for use in the harsh and hot conditions of a fireground. Its exaggerated buttons and asymmetrical shape help you find the controls without looking, even while wearing bulky gloves. The XE RSM is the first accessory with dual microphone noise suppression, allowing clear communication in demanding and extreme noise environments. Designed with the interior firefighter in mind, the Xtreme Temperature Cable attached to the RSM is formulated with a proprietary blend of materials that offers a significantly higher jacket material melting temperature than the standard cable. The XE RSM also features a strobe light that activates when the emergency button is pressed, casting light up to 10 feet in thick smoke. And if the RSM gets sprayed with a hose or dropped in a pool of water, you’ll see what rugged specs (IP68 submersibility) and a unique water-draining speaker design really mean.